Introduction and history of site Grindr is a social discovery app that makes it possible for gay, or bisexual men to find each other when they are in close proximity. The app was launched on the 25th of March 2009 by Nearby Buddy Finder, LLC. Later in 2010, the same company would launch Blendr, which is specifically designed for non-sexual encounters. Amount of members Currently Grindr has over 5 million users worldwide. Features Grindr is available for both iOS as Android, as well as Blackberry OS. The app can specify different guys that are physically near you and basically gives you the option to get in touch with these guys. 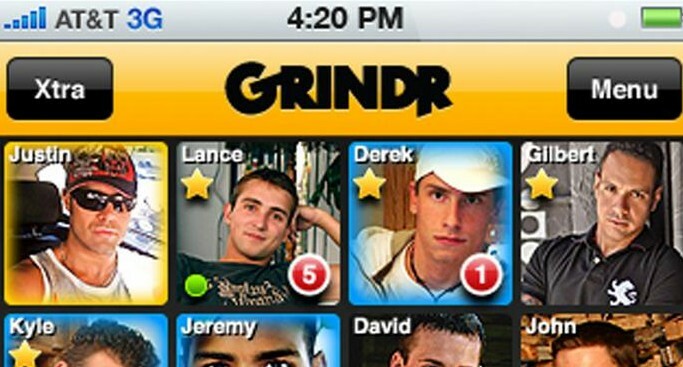 Grindr Extra has more options on top of the basic ones such as messaging and checking out profiles. These opitons include the lack of banner ads, push notifications, seeing up to 300 guys, accessing all filters, joining more Grindr tribes, getting unlimited favorites and blocks. Swiping through profiles and viewing who are online now also are a possibility through Grindr Extra. Grindr is part of Grindr LLC. They can only be contacted through different forms on their website. The company is based in Hollywood, California and currently has around 50 employees.